The bible of authentic Italian cooking, “Il Cucchiaio d’argento” was first published in Italy in 1950, being Italy’s best-selling cookbook for over fifty years now. First contact I made with it some years ago at our Italian friends place, but as my Italian is practically non-existent I had to believe my friends remarks on how essential the book was for traditional Italian cooking. The more surprised I was, when out of the blue Phaidon Press Limited contacted us to see if we were interested in doing a review of the just published English version of THE SILVER SPOON. My eyes naturally started sparkling at the sound of the word “cookbook”, but I also wanted to make sure that certain ground rules important to us are being accepted – so we shared with them our “guidelines”, which basically entailed that we would openly and unbiased write from our point of view – may it be good or bad. Phaidon accepted. Now it was my turn to decide how to properly conduct the review of this cookbook. It’d be ridiculous to say I wouldn’t fall for cookbooks with extravagant, polished food photography, however, the real value of a cookbook is yet to be defined by the quality of its recipes and the soaring enthusiasm of the home cook after successfully preparing a new dish. So, what’s more obvious than trying to recreate a few selected dishes from THE SILVER SPOON, even if it meant exactly following the recipes without sneaking in any modifications – probably the hardest part for me. Twist my arm! The book: Containing over 1200 pages, it is the most comprehensive anthology of authentic Italian recipes I have in my collection. While on a first glance I wouldn’t classify THE SILVER SPOON – the all-embracing, encyclopaedical compilation of one nation’s kitchen, almost as heavy as a brick-stone – as the kind of cookbook I usually look out for, this book taught me better. Combining both traditional and contemporary recipes, it has been adapted to cater to the different cultural and geographical approaches in cooking (including conversion of measurements). The meat section for instance illustrates the different cuts and their nomenclature, a regional guide for pork cuts (etc.) so to speak. The English version isn’t just an exact translation of the Italian recipes, it is more elaborate yet with the intention to sustain the original character of the book. A nice add-on: the original Italian titles are maintained supplementary throughout the cookbook. Instructions are concise, nevertheless provide enough information so a less experienced cook should be able to complete the recipe. The 2000 recipes are divided into 14 chapters, beginning with general information on cooking terms and equipment, leading over to antipasti and first courses, off to vegetable, meat, poultry and fish and last but not least, cheese and desserts. Surprisingly, I didn’t find any original bread recipes, which I would have expected to be covered to some extend (focaccia, ciabatta,…). Other areas, e.g. addressing the use of offal and local vegetables (ever heard of buck’s horn plantain?) have been paid more attention – which of course can be derived from the book’s origin. Each part starts with a short introduction, accompanied by charming little illustrations, reminding me of cheeky pencil sketches. Layout-wise every chapter features a different color, thus providing quick and handy access to the desired topic. The applied photography is pure and simple in style, no redundant accessories, it’s all about the food, depicted on very appealing full-page images (photographed by Jason Lowe, all shot in natural light). A very nice amendment to the general recipe collection is the last chapter, presenting over 20 multi-course menus from famous chefs like Mario Batali (Babbo Ristorante e Enoteca, New York) or Ruth Rogers and Rose Gray (The River Café, London) for even more culinary inspiration. In summary: Apart from the fact that it kept me reading for almost two hours right after I opened the box, although I just wanted to skim across it for a first impression, it’s already cluttered with countless Post-Its – recipes I have lined up to try soon. Being the most comprehensive collection of down to earth Italian recipes, it doesn’t surprise, that it’s oftentimes compared to milestones like “Joy of Cooking”. Last but not least, it’s long history of being a definitive book in any Italian kitchen, makes you feel to have found the origins of the Italian cuisine. Key to success here is not simply following the trend “Italian Food”, like so many other uncountable publications do, but the fact that the country itself, for more than half a century, uses the book as a benchmark for its wonderful and worldwide praised cuisine. The chosen and tested recipes: The following three examples have been selected to provide both insight into the writing style as well as document the results. 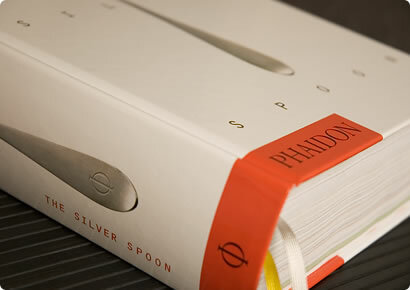 In favor of an accurate impression, the instructions – with the permission of Phaidon Press Limited – have been reprinted 1:1. The included images and summaries depict our outcome. Instructions: Melt 100 g/31/z oz of the butter in a heatproof bowl over a pan of barely simmering water. Remove from the heat and set aside to cool. Melt the remaining butter in a frying pan. Add the chicken livers, onion and thyme and cook over a medium heat, stirring frequently, for 2 minutes. Sprinkle with the Marsala, season with salt and pepper and cook for 3 minutes. Remove the pan from the heat, chop the chicken livers and place in a bowl. Stir in the cooled melted butter, then add the brandy and fold in the cream. Chill in the refrigerator for 6 hours. My resume: Wow. Just wow. 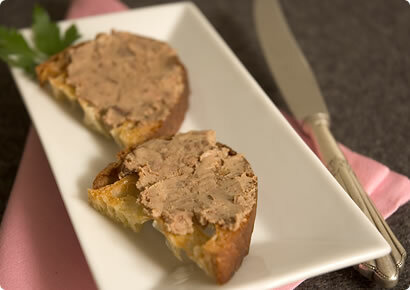 Never thought I could make such an amazing Chicken Liver Pâté like it was nothing. Does an overall preparation time of less than 15 minutes sound too good to be true? Totally doable. The aroma of sautéed liver combined with thyme and Marsala were floating throughout the apartment and the 6 hours chilling time were not easy to overcome ;) Experimenting and spreading it on different types of bread the next days, my favorite combination was a slightly buttered pan-toasted ciabatta and walnut-bread, drizzled with olive oil and roasted in the oven until golden brown. Just added the recipe to my list of all-time-favs of compelling party finger foods… Finger-licking-good! Instructions: Preheat the oven to 180°C/350°F/Gas Mark 4. Put the pumpkin in a roasting tin, drizzle with the oil, cover with foil and bake for about 1 hour. Pass the pumpkin through a food mill into a bowl, add the Parmesan and eggs and season with salt and pepper. Stir in enough breadcrumbs to make a fairly firm mixture. Rollout the pasta dough into a sheet and stamp out 7.5-cm/3-inch rounds with a pastry cutter. Spoon a little of the pumpkin filling into the centre of each round, fold in half and crimp the edges. 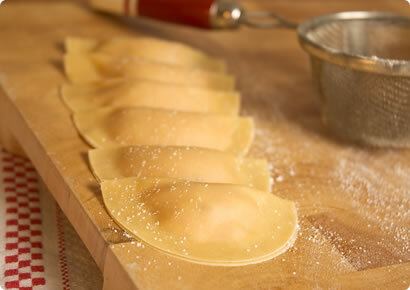 Cook the tortelli in a large pan of salted, boiling water for 10 minutes. Meanwhile, melt the butter in a frying pan, add the sage and cook for a few minutes. 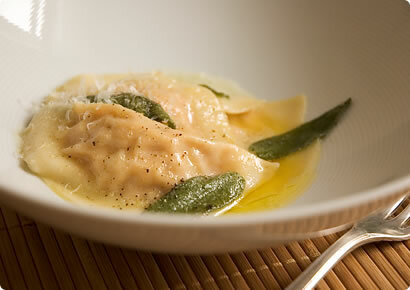 Drain the tortelli, place in a warm serving dish and sprinkle with the sage butter and extra Parmesan. My resume: If somebody serves you home made tortelli, ravioli, tortellini, whatever kind of home-made filled pasta, it translates to a big time compliment. It IS labor of love. As my premise was to stick exactly to the recipes instructions, I didn’t even try to use the KitchenAid to make the pasta dough. Probably the one and only way to prepare pasta dough is with your own hands. I had to add 2 additional tablespoons of water, then the dough looked shiny and felt perfectly elastic. My cognitions about pasta machines are: (A) I had to have one – even if I knew up-front, I would not use it more than once a year. (B) If this rare occasion of making home-made pasta does take place, it takes longer to find it than actually working the dough with it…the pasta machine usually ends up hiding in some box between extra light bulbs and screws and what not – that’s where I found it this time. Thanks for your thorough review. I especially like the "chosen and tested recipes" part. This cookbook sounds like a keeper! Your site is always an inspiration. I especially like, how you connected reviewing the book with testing its recipes. As I like Italian cuisine, I have to check it out for sure! Wonderful review! Although the last thing I need is a new cookbook (ahem), this one has already found its way into my amazon basket, where it will probably sit for just long enough for me to convince myself that I really need a definitive encyclopedia of Italian cooking. The photos are to die for. 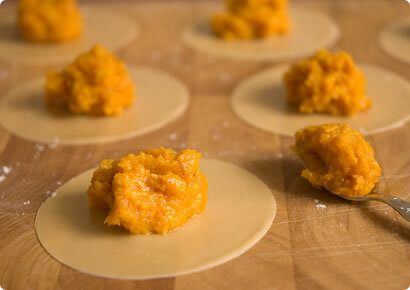 In Italy sometimes folks put crushed amaretti cookies in with the pumpkin then add the stuffing to the ravioli. This enhances the texture and gives a sweet flavor. Hiya, I saw this book at the Frankfurt Book Fair. It was one of the big stars at the Phaidon booth. I'm so jealous you have a copy already. Great post, as always! New to the food blogging world, I find your site a continuous source of inspiration. Brussels spoils me with so many varied restaurants and cuisines, that trying them out one by one is a pleasure. I don't think I will find the patience to make my won paste anytime soon :) - but both the recipes and the book are definitely worth the time and investment. I've been visiting your blog for some weeks now, it's one of my favorites! Just added the reviewed cookbook to my wishlist, it sounds wonderful and I don't have any Italian cookbook yet. I wanted to let you know that my first jam making foray went well! Thanks so much for your help! Thank you! The book is worth every cent - at its price, unbeatable. Especially because of the books layout and concise writing, it makes you want to try its recipes - unlike some cookbooks that are nice to look at but basically never used. Thanks for the suggestion, sounds like a great way to tweak the recipe a bit and give it a different touch. Great! What flavours did you you try? Amazing pictures - as always. Thanks for sharing, I think I'll put this cookbook on top of my Christmas wish list. 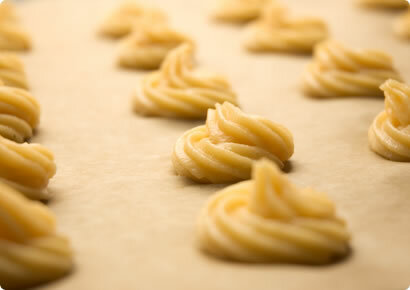 Just 1 question to the profiteroles recipe - the amount of butter doesn't seem right, is it supposed to be 50 grams ? I saw the book in the bookstore last week, and all British newspapers are full of glowing reviews! I've included it to my book wishlist, but as I've just ordered two other books I've lusted after (Casa Moro and Claudia Roden's new Arabesque), it'll probably be a wee while before I actually get hold of the book. Your review is amazing (those pictures again!!!) 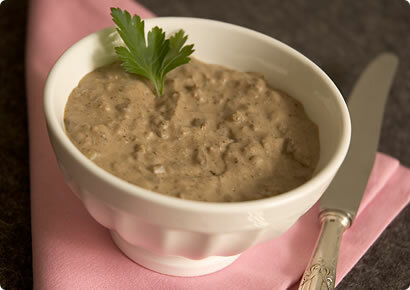 and I will definitely try the chicken liver pate soon. Thanks for the recipes! Love this! Absolutely amazing book review, and a great finale too - the recipes. But before I buy this book, I'd like to know one thing: which version do you recommend me to buy, the UK or US edition? Thanks for answering my question and keep up with the good work! "The many differences in language and editorial style between the UK and US, (for example measurements and different names for foods) meant we had to create separate editions of The Silver Spoon for both markets." Hi! My family has used that cookbook for decades. Our edition is of the early 60s and I suppose it's way different from the one you have. This is my favourite cookbook of all the ones I have (not as extensive as your collection, but I'm happy with it!). All the recipes look so do-able, so unpretentious and utterly delicious. I'll be making a few tonight, will post how they go tomorrow! I very much enjoyed your post and thought it looked marvelous! I have recently embarked upon a blog journey myself where I have dedicated all of my posts to analyzing and discovering The Silver Spoon's recipes. After reading yours, I feel I have to step it up and work harder - and definitely do more with photography. Yours look gorgeous. Thanks for the inspiration! I've just received this as a present and am curious as to the fuss. Before attempting a recipe from a new book I'll often compare the book's treatment of a basic dish to one I know well. Not a good start. The broccoli is to be boiled for 15? minutes and then sauteed for another 15 minutes??!! This brings to mind the original Joy of Cooking's propensity to boil away the taste and texture of vegetables. Looking for the recipe for a Five Onion Soup....can you help? Nicky - I know you wrote this a long time ago, but when I first read your blog last year, I stopped because I found it intimidating. I was just a beginner in the kitchen and was afraid of not measuring up. Almost one year later, I am making my way through your archives. I love cookery books, so I'm starting here first. I have thought about "The Silver Spoon" for the longest time, and your experience with the recipes has convinced me of the book's quality. Jason Lowe is a great photographer, and your photos are hunger-inducing. A fair and balanced review - Cheers! After having heard a lot about it from my American friend who orders copies of it to fill every single space that she inhabits, I decided to get the Silver Spoon. Though it took ages for it to arrive here in India, its now available all over and though a bit pricey, I would say its definitely worth it. Incidentally, I tried the Tiramisu and Profiteroles recipe too and loved both. I like to follow a recipe to a T in the beginning to do justice to whoever worked on the recipe and to discover what the author intended. However I do tend to make changes as I go if I find that the output doesn't shape up to what the book says it should or if I find that I am aiming at something slightly different. In this case, I think a bit of both happened. For the Tiramisu, I found that the book called for way too much chocolate and for the profiteroles, like you, I wanted to stick to my favorite filling ..whipped cream. I did also cook one recipe that was a total downer for me but then that's not enough to judge THIS book for the same reason that you say. If the Italians think the book works, then it has to be ok for an Indian..no? I am definitely going to be using this book as extensively as I can. Though I hate to say it, what could keep me from using it as much as I want to, could be that I find it a bit hard to browse through. While I adore massive cookbooks, I do find myself using the large ones less often. Also the categorization probably doesn't match the way I tend to cook. Am curious, did you find that a problem too or is it just me? I love The Silver Spoon. This week I made the almond-coated sole, which was delicious. Last night I made the sausage with leeks au-gratin. It was so simple to make, and it turned out perfect!